Elaine has had a passion for music since she was a child. This was first realised with the violin, but her apetite for singing later became clear. She has performed in many situations, including classical choral pieces and acapella choirs. Although a late comer to jazz, she has a deep love for it. Whilst largely self taught Elaine has natural talent, understanding harmony, phrasing and interpretation. She is blessed with a genuinely distinctive sound, drawing reference from her influences such as Ella Fitzgerald and Diana Krall. She has a subtle style and an amazing range with a low resonance that will stand the hairs on the back of your neck on end. 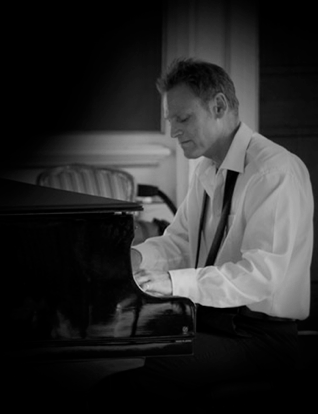 Neil began learning the piano at a very early age and a musical career was in no doubt. He focussed on an extensive classical repertoire initially, but studied jazz at the Leeds College of Music, winning the ‘best performance on a keyboard instrument’ prize in his final year. Since then, Neil has worked extensively in the music business from cruise ships to variety theatre and musicals. He has backed many artists and has been sought after for many shows. His piano style is electrifying and animated. Fans of the ‘ivories’ are in for a treat. His use of plush harmonies coupled with a really tasteful improvisatory flair compliments Elaine’s vocal style perfectly.